Above: The remaining kiln standing beside New King’s Road. 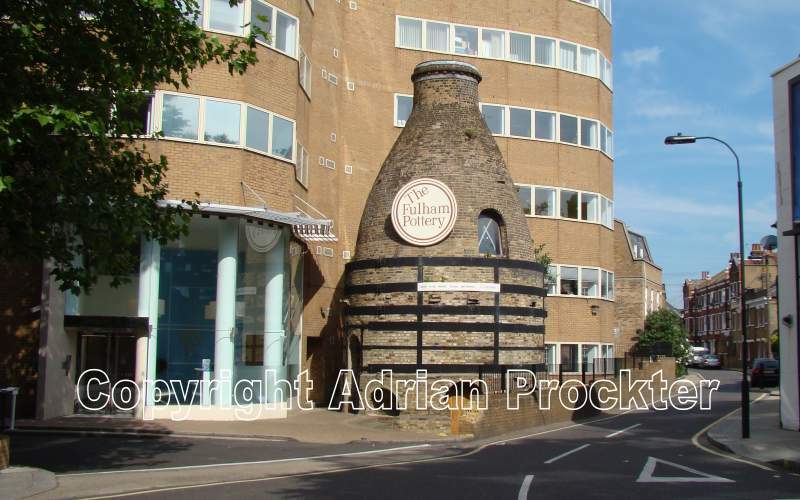 Fulham Pottery was founded in Fulham by John Dwight in 1672. From the earliest days, the pottery was a significant manufacturer of salt glaze pottery. The site is at the junction of New King’s Road and Burlington Road, a short distance from the northern end of Putney Bridge. Today, all that remains of the original pottery is one large kiln which is a Grade II listed building. Many potteries have been set up across London over the centuries. One early site, established by the 16th century, was close to the present-day site of Southwark Cathedral. Other potteries were further east – in Rotherhithe and in Bermondsey. Lambeth was also a site for several potteries, all of them near the riverside to allow clay suitable for a pottery to be delivered by ship. The most famous of all those in Lambeth was the Doulton Pottery. Bow Pottery, is East London, became famous for a time as did the Chelsea Pottery. The Fulham Pottery was possibly less well-known throughout its history. John Dwight took out a patent for the production of stoneware – a process of firing clay pots and bottles whereby the glaze becomes nearly white, rather like stone. Such vessels had a smooth glaze – unlike the rough surface caused by a normal firing – was useful for producing vessels that held foods and drinks. The glaze was also used to produce ornamental items that were further decorated – like plates and vases. In later years C J C Bailey was running the pottery. His name appears for the year 1864, for example. He was producing vases and also jars for storing food on sale in shops – like salmon paste and caviar. The jars were quite thick and, in a world where households did not have refrigerators, the pots were sold chilled by ice in the grocer’s shop and would remain cool while being carried to the household. They were further cooled by having ice delivered to the house. The early industrial side of London has, in the main been swept away in the name of progress. As London expands, any industry these days is seldom situated in areas of housing. Most of the old sites of potteries have been consigned to history and it is only possible to find out about such early sites from history books and early maps. The fact that this single pottery remains beside a road, even though it is no longer in use, is a reminder of one of the more unusual industries of Fulham. This entry was posted in /Ham-Fulham. Bookmark the permalink.